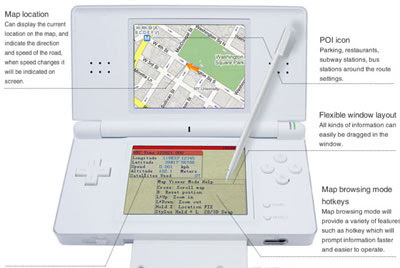 Ranger claims to be a fully functioning GPS navigation system for the NDS console. The Ranger uses Google Maps to show the user's current location, the current direction and speed of travel and nearby points of interest. In addition to Google Map's traditional 2D flat map display the Ranger can convert the map tiles into a more 3D like view. Ranger also claim that the device cab be connected to the USB port of a laptop and therefore turn any computer into a navigational device.